Explanation: The Milky Way was not created by an evaporating lake. The colourful pool of water, about 10 metres across, is known as Silex Spring and is located in Yellowstone National Park in Wyoming, USA. Illuminated artificially, the colours are caused by layers of bacteria that grow in the hot spring. 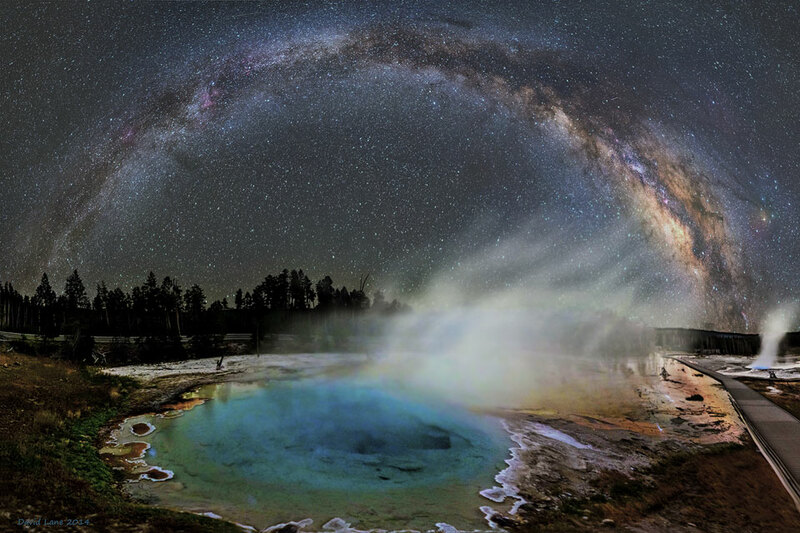 Steam rises off the spring, heated by a magma chamber deep underneath known as the Yellowstone hotspot. Unrelated and far in the distance, the central band of our Milky Way Galaxy arches high overhead, a band lit by billions of stars. The above picture is a 16-image panorama taken late last month. If the Yellowstone hotspot causes another supervolcanic eruption as it did 640,000 years ago, a large part of North America would be affected.